Surface treatment prevents "locking" with aluminium block. 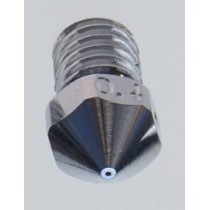 Sizes 0.25- 2.0mm Worlds Biggest Nozzle for Raise3D N2. -Hard metal coated Brass. Makes for easier outside cleaning.-Precision manufacture in Norway at an ISO 9001 certified facility. * -does not apply to 0.25mm and as this small size does not benefit from the Matchless technology. * - 0.40mm not available yet. Greatly increase plastic throughput according to this formula. In many applications you can benefit from printing an equally low layer as before, but several times wider so you need fewer passes since the wall will be 1-2mm thick just by one pass. 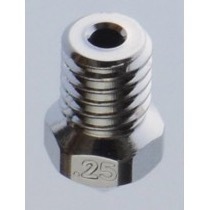 Nozzle size (mm) X layerheight (mm) X printing speed (mm/sec) = cubic mm plastic/sec. 0.60 nozzle example: 0.60 x 0.15 x 150 = 13.5 cubic/sec. 1.0 nozzle example: 1.0 x 0.3 x 100 = 30 cubic/sec. ( already world record for Raise3d). 2.0 nozzle example: 2.0 x 1.0 x 40 = 40 cubic/sec. ( !! ). 2.0 alternative xample: 2.0 x 0.15 layer x 100mm/sec = 30 cubic/sec. Using a BONDTECH feeder for Raise3D can significantly increase these figures, on some cases up to double ore more, depending on your filament, model, and printer/slicer settings.